A Rio Grande wild turkey photographed just south of Carlsbad, NM on film. Water and reflection was added on a phone app. The backlight coming through the wings is beautiful, Joe. It is interesting how the ripples in the water define the reflection, and all on a phone app. Quite entertaining and clever, Joe. 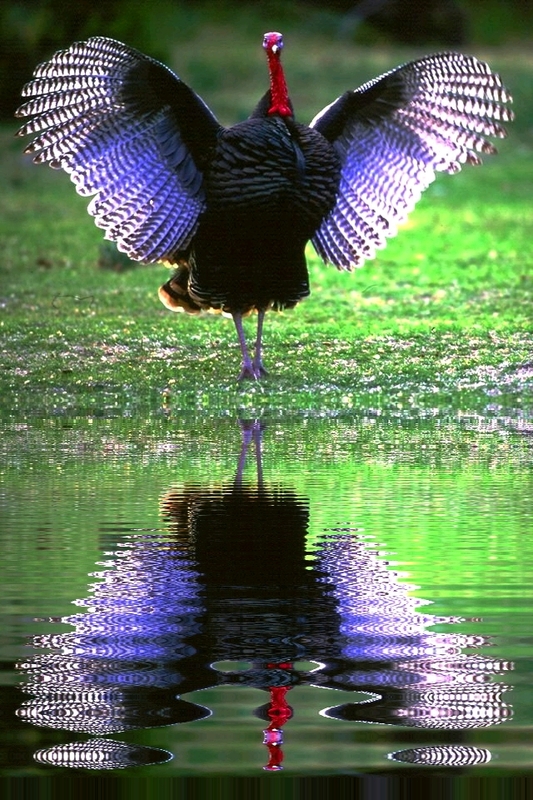 Yikes- I wouldn't want to be this turkey right now-it's hunting season, and it seems to be a prime target! That explains the pose.........someone just said ''Hands Up!''...... or in this case, Wings Up. Who would have thought a few years ago that this would be possible on a phone. Amazing, and I love the backlight through the wing feathers, Joe. Thanks, all, for your comments. New phones and apps are amazing. They are a powerful tool that I believe to be the future of imaging not that far away from now. Joe, wow, that's amazing, both the ta-dah! spread-wing pose and the ethereal reflection with those hypnotic, wavy lines - super fun, delightful presentation!